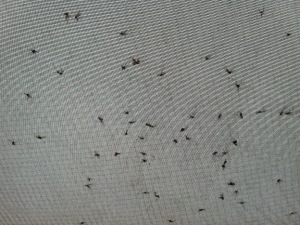 Where I rubbed the inner tent screen against the outer tent fly. It’s a good thing I’m not in Minnesota, where these are protected as the state bird. Those tiny things wouldn’t last ten minutes in Minnesota. The Mosquitos in Uganda and Fort Lewis, WA combined wouldn’t be able to make a mosquito-transformer (let’s call him Superion) that would be comparable to a prematurely birthed and still born Minnesota mosquito larvae. Looks like your having an amazing trip, happy late Marine Corp Birthday to you and be safe! Thanks, Jacob. Looking forward to seeing you when I pass through Rome.